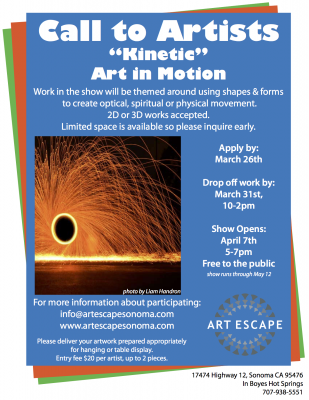 “Kinetic” April 7th through May 12th. Use shapes and forms to create 2D or 3D works showcasing what movement means to you. Submissions accepted for 2d and 3d work using any medium in any way you choose to interpret the theme. Please deliver your artwork prepared appropriately for hanging or table display. Entry fee $20 per artist.